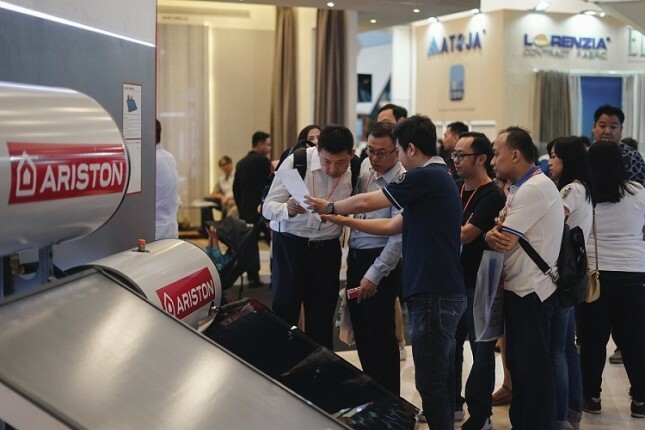 INDUSTRY.co.id - Jakarta - One of the global companies in the thermal comfort sector (thermic comfort), Ariston Thermo Indonesia (ATI), recently re-participated in the exhibition IndoBuildTech 2018. At this exhibition, ATI again showcasing its superior water heater product line. And introduce two new product variants, namely technology Andris AG + and Fast R.
"The Andris AG + technology complements the Ariston Thermo Indonesia Electric Storage Electric Heater product lineup, the new variant is equipped with AG + technology that can prevent bacteria and fungus growth in water heater tanks by up to 80%," said Jacopo Guazzarotti, Marketing & Project Sales Manager, Ariston Thermo Group (2/5) in ICE BSD. Jacopo Adds, Silver Ion AG + technology applied to Andris AG + can protect and reduce the growth of bacteria such as E.Coli, Salmonella, Legionella, mushrooms, etc. when water enters the tank. In addition, the Fast R variant as part of the Ariston Thermo Indonesia Instant Water Heater product range. "Fast R is equipped with 2 Pin technology to produce faster heating time. This product also comes with additional security features that can prevent flame when there is no water flow, turn off the water heater unit automatically when the water temperature is too high, and stop the gas flow automatically when there is no fire to prevent gas leakage, "he said. This Fast R feature delivers rapid water heating capability with added extra security specially designed for consumers living in areas with cold temperatures. "We hope, through this latest innovation, we can help answer the needs of customers to feel the combination of optimal, energy-efficient, and environmentally-friendly warm bath comfort."